The weather of late is really awesome besides the rain though and the thoughts of our laundry and I don’t think I will ever owned a dryer. Other than that, I really love it! You see I am more afraid of heat (which often gives me migraine) than the cold. With a chilled out Sat as son is away for his soccer training and there isn't any more Sunday School (yes it is on a Sat), we spent a carefree and relaxing Sat morning. After sending son off to school, I decided to swing by the wet market and then impromptu, I got some grated coconut for I wanted to make oneh oneh as I brought some purple sweet potatoes before the weekend. I love ondeh ondeh but I dislike eating the desiccated coconut but surprisingly, this one is alright for me. It didn’t get stuck in my throat! I just love how it turned out. The purple ondeh ondeh matches so nicely with the white grated coconut! And I love the texture as well! hi edith, I love the colors on the purple ondeh ondeh. Care to share which recipe you'd used? Those oneh oneh looks very yummy and pretty with my favourite purple colour. 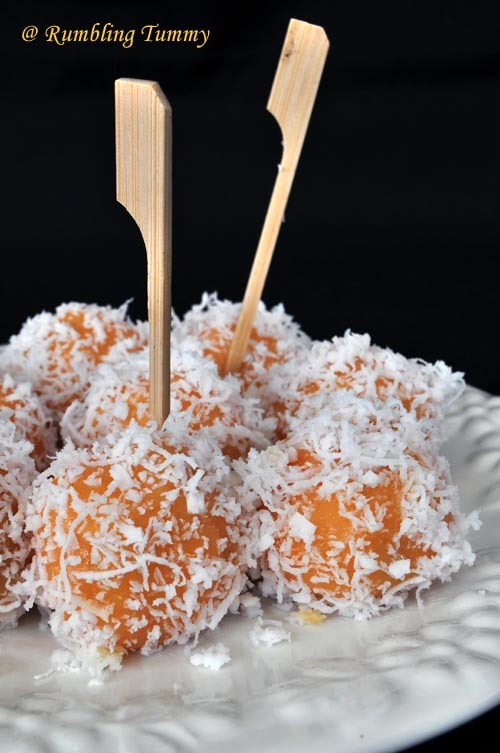 Edith, I just made a batch of these and gave them to my family yesterday :) With Onde Onde, you don't have to worry about dessicated coconut, we never use that - only fresh grated coconut and they are delicious! travellingfoodies, I got it from Do What I Like. Thanks Ann@Anncoo Journal, I am actually quite happy how it turned out. quizzine, hahah you are like me. I guess you cannot eat chye sim. Shirley, these are addictive aren't they? Am sure your family was happy to munch on it. Yes, I learnt that home made ones are even better than store brought. Some how I have problem all these years eating store brought. After making my own, I realised what is the problem,. Freshly grated coconut! I only had green onde onde. Would love to try the purple one. I really love the colour and I bet it's yummy! Purple ondeh ondeh sounds like kueh fit for the royal family! Unique! And all that gula melaka oozingly yummy! Your ondeh-ondeh has a lovely colour! Looks good! Edith, very nice purple color. Very tempting. One of my favourite too. Your colour of purple ondeh2x is too attractive to be admired :) I ever made once, but the colour was dark purple instead of bright purple. I totally agree with you about the weather we have been having lately. On Sunday when the sun was out in the morning, I quickly did my laundry and hung everything outside on my balcony! I used to not like ondeh ondeh but i love it now! love biting into one and having the sweet gula melaka squirt out! the purple version looks gorgeous!! after using really freshly grated coconut, I now enjoyed this even further. Not sure if you'd be reading this.. I had my first attempt on ondeh ondeh but i think it fail. The skin is too thick, probably because I don't have the skill of really kneading it. The worst is that the skin has got this "powdery" texture and a "raw" taste. I've make sure it's cooked before scoping all up. any idea why there's the "raw" taste and "powdery" texture? Thanks.. Sorry to hear about your failed attempt. It seems like you didn't knead the dough well and steam it well. Could be that your skin is thick so the steaming time needed to be longer.